A bindrune is a type of rune that encompasses two or more runes to create a greater meaning. This Viking Virility Runering utilizes two such runes to channel positive effects that any warrior would wish to have. 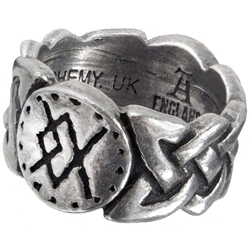 The ring is two-faced, allowing you to display the bindrune of your choice. One side depicts Tiwaz and Uruz, symbolic of courage and fighting strength. The other side depicts Ingwaz and Gebo to symbolize masculinity and partnership. Celtic bands bind the two runes on either side. This Viking Virility Runering is a powerful talisman that you can change to suit your need, depending on the energies that you need to draw on during your day.